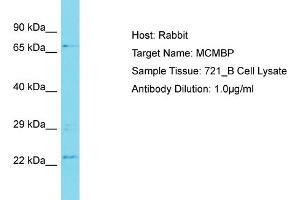 Characteristics This is a rabbit polyclonal antibody against MCMBP. It was validated on Western Blot. Background This gene encodes a protein which is a component of the hexameric minichromosome maintenance (MCM) complex which regulates initiation and elongation of DNA. Multiple transcript variants encoding different isoforms have been found for this gene.